Fission Superstar X is a relentless rogue-lite shooter from Turbo Pelvis 3000 Inc. Blast off in Dr. Leopold’s bomber. Tour the solar system on a desperate randomly generated bomb run. Face impossible odds trying to achieve the demented dream of an insane scientist. 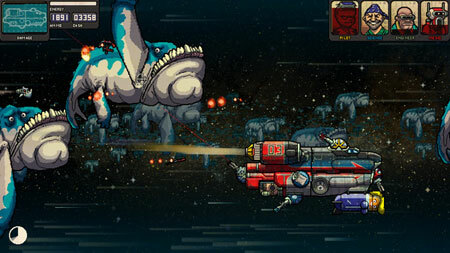 Travel from Planet X to Earth while fending off endless waves of attackers. While working on his latest nuclear bomb, Dr. Leopold had a revelation. He wasn’t creating a weapon of mass destruction; he was creating a nuclear superstar. You must do his bidding and tour the solar system with Celine, his dear bomb. Fight using ranged and melee weapons while blocking attacks with your shield. Unlock 9 playable ships. There are over 100 different possible crew members, from humans to space bears. Choose from 64 different weapons, from puny rifles to nuclear mortars. Enjoy over 20 different scientifically inaccurate environments, such as space whale pods and planetary atmospheres. Fight giant bosses on 8 different worlds from Pluto to Earth. Upgrade your ships, modify your famous payload, assemble the perfect crew and buy destructive weapons. If you get stuck in the game, check out the video walkthrough and gameplay for the game. This entry was posted in PC Games, Walkthrough and tagged Fission Superstar X Cheats, Fission Superstar X Game, Fission Superstar X Gameplay, Fission Superstar X Guide, Fission Superstar X Hints, Fission Superstar X Review, Fission Superstar X Solutions, Fission Superstar X Strategy, Fission Superstar X Tips, Fission Superstar X Walkthrough by Marvin. Bookmark the permalink.